The Fuetsa Basketball Club will face Guam Community College for the title in the Trident Women's Basketball League at 2 p.m. March 10 in the University of Guam Calvo Field House. Fuetsa demolished the University of Guam Lady Trident Women's Basketball Club 71-36 Thursday in a semifinal game at the field house, according to a UOG news release. The Tridents played their best half of the season, trailing top-ranked Fuetsa just 20-19, but Fuetsa blew out the Tridents in the second half. April Talledo led Fuetsa with 31 points, 23 of them in the second half, while Shae Banez added 15. 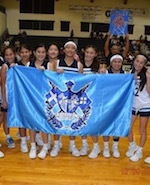 Via DeFant scored 17 points, for the Tridents, according to the news release. GCC beat the Royal Basketball Club 56-48 to advance to the championship game. Nica Mojas led GCC with 21 points, while Crystal Pardilia added 14 points. N. Perez and E. Perez each scored 11 for the Royals, the news release stated. The boys' team came out strong against the taller Grace International School Tigers. Most of the starters were members of the 2017 team that fell to third place after the Tigers eliminated them at the ACSC in Penang, Malaysia. The Warriors made sure to shut the door as soon as possible said senior D'Angelo Gallardo. 'The coaches did a great job of getting us focused and keeping us on track. We just wanted this one really bad especially because it's the championship game,' he said. 'We locked in on defense, and we were hitting shots. Once we clicked, we started to pull away.' The proof was in the scorebook. The Warriors led 23-19 in the first quarter and 33-27 at the half, before they outscored the Tigers 23-6 in the third for a 56-33 lead going into the final quarter. According to senior Josh Gatchalian, the team's family atmosphere is what kept them pushing each game. 'We always have each other's backs. Every win and every struggle that we've faced, we've always faced it together. We play for God and each other.' Most Valuable Player Jahmar White led the team with 20 points, with Diaz dropping 18 points. Gallardo and teammate Reo Aiken finished with 12 and 10 points apiece. For Diaz, the victory was four years in the making. 'It's been a rough ride, but it's a blessing to end it with a 'ship in hand,' Diaz said. 'It's an awesome feeling to win it, especially as a senior. Wouldn't have been possible without God's grace.' The Warriors started off the day with a 58-36 victory over the Faith Academy Vanguards to advance to the title game. White and Diaz led the team with 15 and 12 points respectively. At the tournament's banquet, Diaz was named the Defensive Player, while Gatchalian, Diaz, and White were named to the All-Tournament team. 'I give credit to my team and coaches. They always have my back and were always supporting me every step of the way,' White said of his MVP acknowledgment. With the victory, Pineda can now focus on the next task at hand - defending the Warriors' Independent Interscholastic Athletic Association of Guam boys' basketball title. 'We need to get some rest and get some guys healed up. It has been a grueling season so far, and the tournament was very physical. I want to give a shout out to the bench they came in helped us when we needed it,' Pineda said.